(Article by Brian Jones, writer of the book) Visitors to Malaga, and those living along the coast or in the hinterland may like to know of the publication of a new guide to the city. It is something which grew out of the experiences of my wife and I showing friends around the city over the past five years. The guide is designed to make life as simple as possible. No poring over street plans, to find places of interest, and work out how to get from one to another. Instead the first half of the guide present straight-forward instructions for a circular walking route, taking in all the principal points of interest: the old lighthouse, the port, the Paseo del Parque, the Atarazanas market, Calle Marques de Larios, Plaza de la Constitucion, Plaza de la Merced, the Picasso Museums, the Modern Art Musuem, the Roman Theatre, the Alcazaba and the Castillo del Gibralfaro, the Hospital Noble, the Bullring, the English cemetery, and much much more. The route takes from four to five hours, walked at a leisurely place: but as the guide warns – stop and linger on the way and it can give a lifetime of pleasure. Beside the route instructions there are boxes providing basic information about things you will see – but deliberately no more than can sensibly be absorbed while walking along. And in the second half of the book there are features on aspects of the city’s history, culture and leading historical figures – the story of General Torrijos; Dr Joseph Noble; the wreck of the Gneisanau; the English Cemetery and so on. So if you do not know Malaga as well as you would like, why not track down a copy of this colourful and inexpensive guide. Once you have it to hand you can start anywhere on the circular route. Just follow the footsteps in the text! And, of course, winter-time is just perfect for such exploration. Footsteps through the City of Malaga (ISBN 978 0 956 1014 0 2) is available at a growing number of bookshops (such as Rayuela Idiomas on Plaza de la Merced, and Libreria Luces on the Alameda). 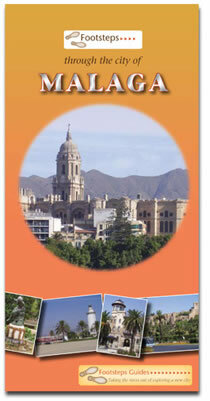 Or it can be purchased online at www.guide-to-malaga.co.uk, through Amazon UK, or on E-Bay (£4.99 + p&p). Are You Thinking Of Holidaying in Malaga?